WASHINGTON, D.C. -- As negotiations continue between Iran and six major global powers about the future of the country's nuclear program, Iranians have more hope than they did in 2013 that both sides will eventually reach an agreement. When asked about their hopes for talks between Iran and the European Union, which was initially in the foreground of negotiations, 70% of Iranians are at least somewhat hopeful that an agreement will be reached, up from 58% in 2013. Although Iranians were only asked about the talks between the EU and Iran, there are also bilateral talks between the U.S. and Iran and talks between what is known as the P5+1 group: the U.S., Russia, China, the U.K., France and Germany. Because of the overlap of these conversations, Iranians might have been thinking of any combination of these groups when answering the question about "current talks." Some of Iranians' higher hopes for negotiations could reflect the limited easing of economic sanctions that took place before the survey in Iran last year. Further sanctions relief -- in return for limiting Iran's nuclear program -- was on the table this week as U.S. Secretary of State John Kerry held high-level talks with Iranians in Geneva. 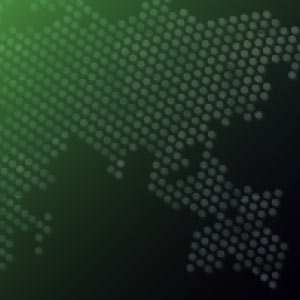 Discussion about sanctions will likely continue next week as negotiators from Iran and the six global powers resume talks and work toward reaching a framework deal by March 31 and a final deal by June 30. 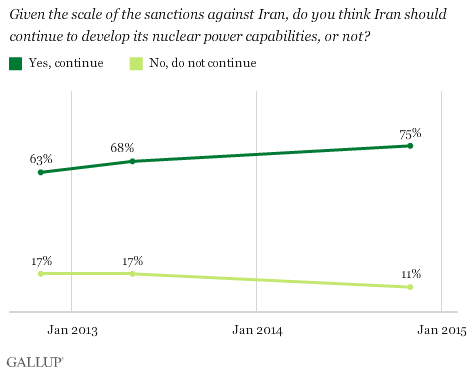 Iranians' support for developing the country's nuclear program has continued to increase. Seventy-five percent of Iranians believe Iran should continue to develop its nuclear power capabilities, up from 68% in the previous survey. Iranians, however, remain divided on the ultimate intention of the country's nuclear program. More than half of Iranians (56%) approve of Iran developing its own nuclear capabilities for non-military use. 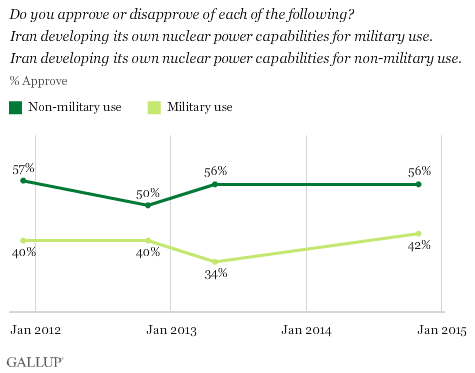 Support for developing such capabilities for military use is somewhat lower, with 42% of Iranians approving. Iranians' approval on each of these issues has not changed much since Gallup started asking these questions in 2011. Iranians who support both the military and civilian nuclear programs are still optimistic about negotiations, pointing to a disconnect between how the international community and how many Iranians view a potential agreement. The international community is concerned about the potential for Iran to develop a nuclear weapon, but many Iranians seem to support both an agreement and Iran developing nuclear power for military purposes. Of those Iranians who approve of Iran's military nuclear program, 72% are somewhat or very hopeful about an agreement, compared with 75% of those who say the same and approve of Iran developing non-military nuclear power. As the Iranian negotiators meet next week with their international counterparts for another round of talks ahead of the June 2015 deadline for a final deal, residents of Iran remain cautiously optimistic about the eventual outcome and solidly support their country's national nuclear program. The Iranian leadership under President Hassan Rouhani has promised to improve average Iranians' economic lot. Achieving a nuclear deal with the Western powers will not be a panacea for Iran's economic woes, but the country is under pressure to try to strike a balance between attaining an international agreement on the one hand and maintaining Iranians' national pride in pursuing the nuclear program and securing economic prosperity on the other. Results are based on telephone interviews with 1,005 adults, aged 15 and older, conducted in November 2014 in Iran. For results based on the total sample of national adults, the margin of sampling error is ±3.9 percentage points at the 95% confidence level. All reported margins of sampling error include computed design effects for weighting. Less than half of Iranians say their government should lend economic, military, or political support to Syria. Fewer Iranians favor economic and military support for Syria than did so in 2012.